Snooze enables you to skip pairings for a week or more, without leaving the channel or changing the pairing date for your team. 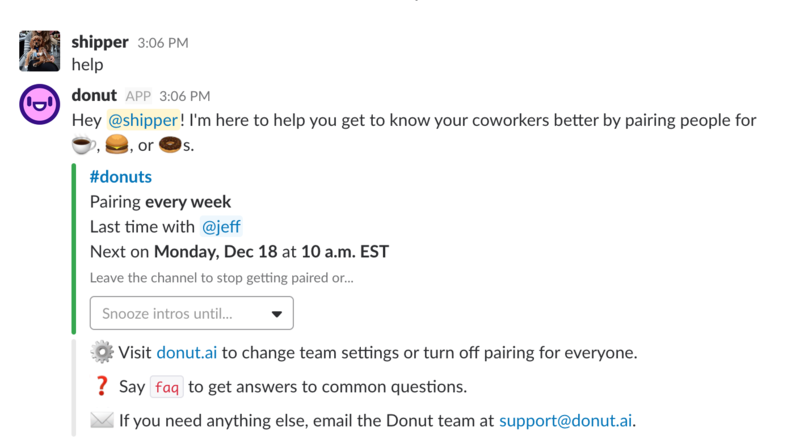 If you'll be out of office or know you won't be able to participate in Donut pairings for a set period of time, we've made it easy to temporarily opt out without leaving the channel altogether or changing pairing dates for your entire team. 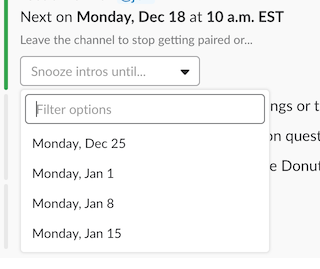 Our snooze feature allows you to selectively skip pairings to fit your schedule, without disrupting your normal pairing schedule or leaving a teammate hanging. 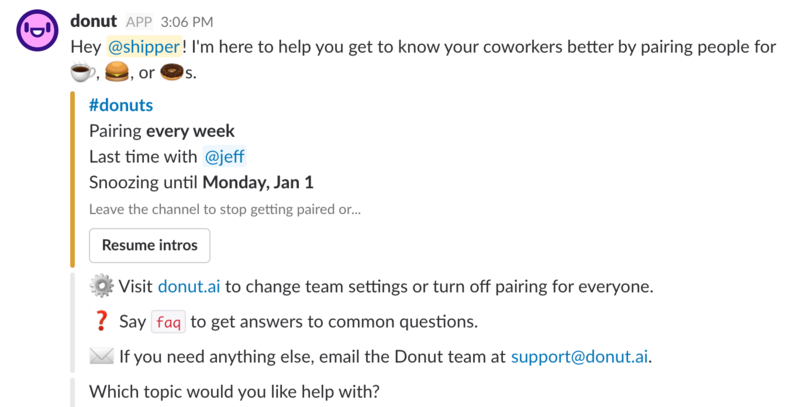 Open up a direct message to Donut in Slack and say "help." Donut will respond with a list of your Donut pairing channels, and the next scheduled pairing date. Click the drop-down menu and select the next available pairing date that works for your schedule. That's it! Donut will automatically resume pairings on the date you've selected. If I snooze, will that impact my teammates' pairings? Nope! Snooze is individually controlled, which means that you're only changing settings for yourself. You will not be changing the next pairing date for your team. If you'd like to do that, just log in at donut.ai to change your team's settings from the central pairings dashboard. I want to resume pairings early. How do I do that? Just select the "resume pairings" button, and you'll receive a pairing on the next scheduled pairing date for your team. I belong to multiple pairing channels. Can I pause all at once? Or skip some but not others? Snooze is configured separately for each pairing channel. When you say "help" in a direct message with Donut, you'll receive a list of pairing channels that you belong to. You'll need to snooze each of these individually, which means that there's no "universal snooze" setting, but you can skip pairings for some channels and not others, which comes in handy if you have a particularly packed week.